WFTO celebrates the 2015 International Women’s Day with women change makers. This year we asked women fair traders to share their thoughts about their work, achievements, the challenges they encounter as women fair traders, and how their work influenced themselves and other women. What we learned from these women is that it does not take extraordinary power for a woman to make a difference to herself, to other women or to her community. They have one thing in common, though, the drive to see change happen. Read on and be inspired. Joining WomenCraft has changed Angelika Rauben’s life. 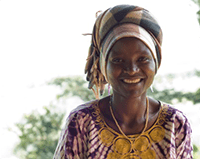 Angelika, who comes from Nyakiziba village in Tanzania and currently the chair of the organisation’s Artisan Advisory Council, had only a few years of schooling. However, limited education does not stop her from doing things that she likes. Today, she is adept in using iPad Mini for marketing their products. According to a WomenCraft staff, when Angelika started taking photos of their products and promoting them, their sales had increased since then. Before WomenCraft, Angelika helped bring income to the family through farming, and still had difficulties providing food for a family of seven. Back then, she had no economic independence, and erratic weather conditions greatly affected their income from farming. Now, she can make her own purchases, even hired someone to cultivate their crops. She has more time to weave, to take care of her children, and pursue other income generating activities. Angelika is a natural leader. She works tirelessly among artisans and staff to ensure other women artisans in the organisation can benefit from their participation. Working in Fair Trade she was able to develop her leadership skills and to become a model for other women in her community. Speaking of inequality, women in developing countries are hardest hit. The gender inequality they experience is reinforced by the economic inequality they are in. 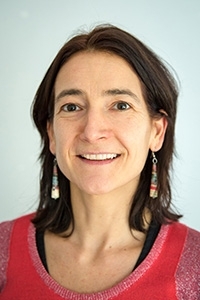 Sophie Tack believes that Fair Trade is a way out for women to escape from these inequalities. As a campaigner, women’s rights and gender equality are not new to Sophie. These are big issues on her table. “Reducing inequalities is a moral and socio-economic priority for men and women,” says Sophie. Sharing a connection with women producers in the southern hemisphere, she said that everyone can be an agent for change. “I work for Oxfam because I believe that change can happen if a global movement is behind it. Overcoming poverty requires active citizenship. She observed that the gap between the rich and the poor is still growing, and the situation is no longer confined to the southern hemisphere alone as it is also happening in the north. “15 years ago we just talked about Southern Fair Trade, now we are also involved in Northern Fair Trade. Challenges are not Southern or Northern anymore, but global. The world may have changed considerably, but Sophie’s commitment and passion for a fairer world remain burning in her heart. Tehatta is a remote Indian village, and mainly an Islamic community. Most villagers are traditional and engaged in embroidery production. According to one tradition, a female child is expected to marry at a very young age, and cannot choose her husband. Two young women in the village challenged this tradition. Arshida Khatoon (20) and Jasmina Khatoon (22) are still not married by choice. “My parents wanted me to get married at a very early age to a man of their choice but as an abled, independent adult I want to take my life’s decisions,” says Jasmina. “We want all women to be self-sufficient and live a life full of dignity,” adds Arshida. In this part of the world, knowledge about needle embroideries has been transmitted from one generation to the next. Despite the fact that they have never been trained, Arshida and Jasmina are very talented embroiderers of Craft Resource Center (CRC Exports). Today, they are earning US$113 a month, which is 31% higher than the West Bengal minimum wage of US$86, see here. Jasmina uses this money to support her father, and to finance her sister’s studies, an ambition she had and wanted to see it fulfilled in her sister. Arshida is economically independent, and likes it this way. She spends her income for her needs, and saves the rest for the future. “When I joined Cojolya, things began to change slowly… now, I have a steady income source,” says María Sosof Ixbalán. Maria would like to share the message that everybody has skills and should be proud the work he or she can accomplish. Her story is an example of how a woman can improve her life given the chance to fulfil her talents. 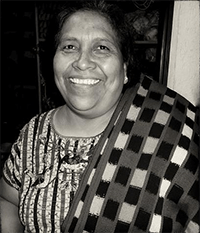 María is one of the expert backstrap weavers of Cojolya Association, an organisation working with Maya artisans in Santiago Atitlán, Guatemala since 1983. The encounter with Petronila Sojuel, a weaver at the Cojolya Association, was a turning point in María’s life. Petronila helped her to become a member in the association, where Maria was taught how to weave. The women weavers of Cojolya are experts in backstrap loom technique. Due to lower orders from buyers, María and other weavers received further training, and were taught on how to diversify their backstrap loom designs to meet market demands. Maria produces for her own business. She makes typical fabrics used to make güipiles (blouses), shawls, napkins, pants and traditional shirts. For Cojolya, she produces cotton fabrics, scarves, and shawls. For Renice Jones, to be an agent for change is to take risks. 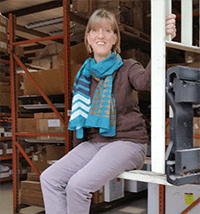 Below is her story about her experience as a buyer and distributor of Fair Trade products. Renice and her husband co-own Global Fair Trade Crafts Inc., based in Edgewater, Florida. They import Fair Trade products from developing countries, and sell it nationwide in the US and Canada. They even have buyers from Australia and New Zealand. The Fair Trade company also operates an online shop. Their commercial motto is flexibility, transparency and the added value of handmade and Fair Trade products. Although exclusivity is a common business practice to discourage competition, Global Crafts is transparent about the origin of their products. Contact information of producers is published on their website. That is the risk they are taking to help producers in the South get more market access. From 1999 to 2002 Renice worked as a Peace Corps volunteer in Kenya. One of her tasks was to help local artisans market their handicrafts. This experience led Renice to help form Global Crafts with her husband. Shabana Nasim comes from Calcutta, India. She encourages women in her local community to take active economic role by joining the Sasha producer community, an Indian Fair Trade organisation. Shabana is currently involved in organising her community to get them a regular income through work. She experienced objections from the community, but Shabana is happy to say that they “have managed to weather the initial storm.” She thanks also men of their community for their help. The mother of Shabana taught her the art of tailoring. She is now sharing this knowledge to other women. She has successfully helped other women, and advocates for women empowerment in the area. 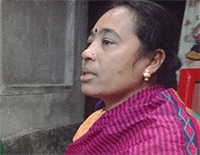 Sagarica is another Indian tailor woman from West Bengal. Like Shabana, she has also fought against traditional roles in her community. She started her own business, and faced the challenges in the market. Later she took up embroidery orders from a local organisation, that was immensely impressed by her work. Her talent has enabled her to become one of the best producers of Sasha. In 2003, thanks to her experience and skills, she formed her own organisation whose mission is to help women. Her organisation is now working with women in nearby communities. Sagarica tells women to engage in active role, especially economic activities. She also encourages men to become part of her tailor shop, and to champion gender equality. ‘Fair Trade Egypt changed my life,’ says Mervat. Mervat lives in a poor village of Mottamedya, in the province of Giza. The province is one of the marginalised regions in Egypt, but Mervat’s entrepreneurial spirit led her to the right track. She learned the art of embroidery by herself, and when she noticed that there was a market for dolls she launched her business. Five years ago she shared her project with Fair Trade Egypt. Since then they have supported her, especially during the Egyptian uprising. She admits that the collaboration with Fair Trade Egypt improved her economic situation and her professional skills. Thanks to Fair Trade Egypt and its partner Mottamedya Women’s Association, Mervat runs a profitable activity and offers a a job to 15 women of her community. When she started the dolls were manually made: later she bought a machine that allowed her to produce a greater number of handicrafts and satisfy a greater number of customers. Mervat is also engaged in the organisation of medical convoys in Mottamedya and invites more women to join the same activity. Work can positively change the mindset of women, said Mervat. She believes that women should give their contribution to the house income as they could provide better opportunities for their children and better food for the whole family.